In a recent discussion about the launch of Common Field, the new national network of artist-run spaces and visual arts organizations, someone said (I don’t know if it was them or us, we were all sitting in a big circle to be nonhierarchical), “This is a movement!”1 I instantly felt myself recoiling. Us, a movement? Does arts administration really constitute viable social transformation? Yet what else do we think we’re doing? Is carrying the torch for an independent, noncommercial, experimental, and challenging field of artist-organizing and artist-centric nonprofits not a lofty and worthy goal? As a field of spaces, projects, and various platforms for the distribution and proliferation of contemporary art driven by artists voices and practices, we are post–alternative-space-movement with its cultural cachet, post–Comprehensive Education and Training Act (CETA) with its funding for artists to work as artists, post–National Association of Artists Organizations (NAAO) with its advocacy for artist fees and governmental support, post–Culture Wars with the scrutiny of the field on a national stage, on the margins of new funding paradigm Creative Placemaking, stewing over the meaning of it all in the special projects and nonprofit section of the art fair, wagging our fingers over valuing the small and the local, and bemoaning the rise of the artist-as-entrepreneur. In other words, what are our demands now? Does calling oneself a movement summon one into being? 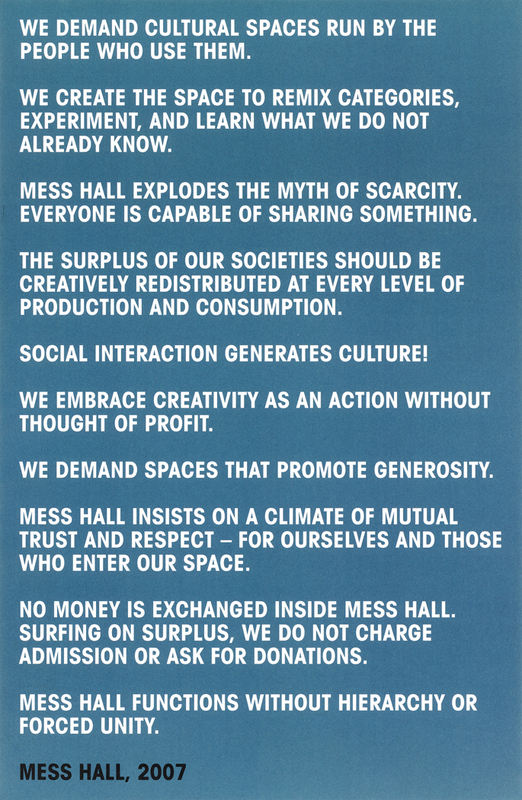 Mess Hall, Ten-Point Statement poster, 2007 (artwork © Mess Hall) Mess Hall was an experimental cultural center based in Chicago’s Rogers Park neighborhood, 2003–13. Operated by a group of keyholders, Mess Hall hosted exhibitions, discussions, film screenings, workshops, concerts, campaigns and meetings, as well as a place for radical politics, visual art, applied ecological design and creative urban planning in a rent free space donated by the landlord, enabling Mess Hall to be a completely free resource for the local community, one of the fundamental principles on which it was founded. Formerly a radical idea, artist organizations were born in the era of 1960s and 1970s social-movement culture in the United States, forming an oppositional bloc to the rarefied worlds of museums and commercial galleries in the spirit of communalism, multiculturalism, and decentralization. While certainly not bound by a shared worldview, the politics of self-organizing was key to the movement. Today, small to mid-size visual arts organizations struggle to survive as viable centers that are responsive platforms for working artists, both in navigating fundraising and institutional advancement, but also because our community is fragmented regionally, professionally, and theoretically. While many previous iterations of the alternative space movements have tread and retread similar ground, the threads between histories of such activity and current manifestations seem farther apart than ever. Taking stock of where we stand today requires excavating and assessing shared histories and asking core questions about those to whom this field is relevant. Who are the artists that consider themselves part of contemporary artist-run culture? To conceive of contemporary artists today requires looking at economic barriers to education, the systemic problem of debt accumulation, and the dismantling of public universities, which drastically narrows the number of artists who conceive of themselves as having a professional trajectory in the contemporary visual arts. Graduate school credentials still dominate as an entry-point to discourse, though who can afford it? Yet this is only the first in a series of hurdles. According to the recent study by the collective BFAMFAPhD, which asks, “What is a work of art in the age of $120,000 art degrees?,” only 8 percent of arts graduates in the United States surveyed by the US Census Bureau from 2009 to 2011 make a living as artists.2 While these findings are not self-evident—in other words, one does not have to be employed as an artist or need an art degree to actually be an artist—it clearly points to a narrowing of access to the field. And this is not to mention the field’s already narrow definition of itself, given that, art-historically, artist-run culture and alternative spaces are umbrella terms that tend to refer to contemporary art-focused spaces initiated by trained artists with BFAs or MFAs who consider themselves as belonging to a separate disciplinary category from community arts and community-focused artist spaces. A broader dialogue across the spectrum would make for a much more interesting and relevant set of conversations, but requires navigating and celebrating those differences, without ignoring power and privilege dynamics. What is the public purpose for our work? Today’s funding trends such as Creative Place-making, made possible through partnership enterprises among foundation, governmental, and financial-sector support, such as ArtPlace America, are concentrated on giving art and artists opportunities in diverse communities yet also require artists and arts organizations to think through an entrepreneurial frame by integrating their initiatives into their community’s economic development and community revitalization strategies and having the potential to attract additional private and public support of the community.3 Is this a worthy challenge of contemporary arts insularity or does it discount subversive and against-the-grain art production, made by and for art communities, including that which is made within and by these same diverse communities that are being targeted by new funding initiatives as in need of help in the form of artistic interventions? How are we organized? For those working within small to mid-size visual arts nonprofit organizations, what are the organizational and administrative practices that are implicit to the way we work? The nonprofit model relies on continued growth and capacity building through public and foundation funding, as well as private patronage as a measure of success, requiring a continuing professionalization of the field, for better or for worse. These pragmatic concerns can obfuscate addressing equity in our own organizations, thinking outside of nonprofit logics, and the deep questioning of adopting entrepreneurial strategies. This is not to mention non-non-profits or those operating at the grass-roots level, who have strategies and politics around sustainability or ephemerality, think deeply about emerging forms of production and distribution, and have much to teach more established organizations so as not to replicate traditional administrative strategies as the only course of action. 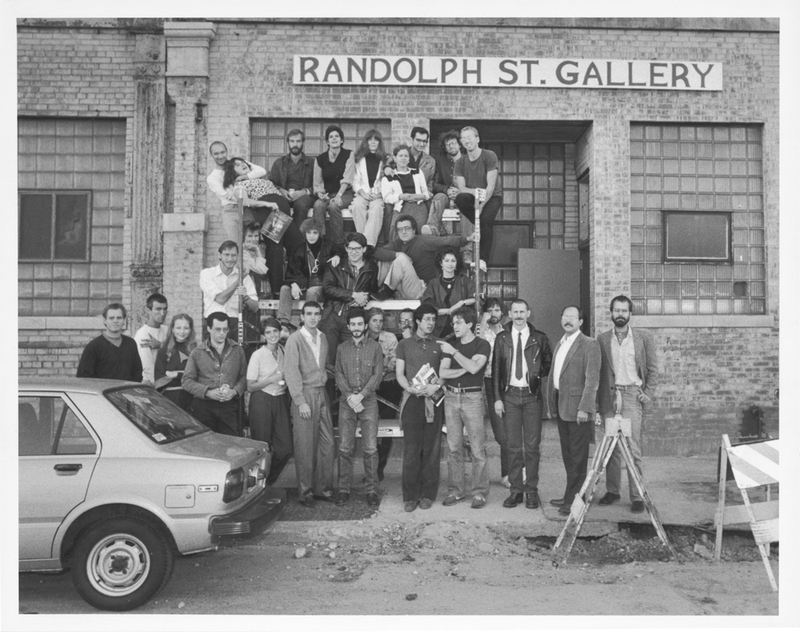 Renny Pritikin, a founding director of San Francisco’s New Langton Arts, has written that the wave of artists’ organizations which started in the 1970s and from which the alternative art space movement is often attributed to initially adopted many of the goals outlined and summarized in the Students for a Democratic Society’s Port Huron Statement from 1962, including participatory democracy and consensus models in decision-making, respect and interest in a multicultural and pluralistic outlook on what art could be, the freedom of ideas not subject to market or corporate influence, and the decentralization of production and dissemination, as artists communities across the country determined their own value without having to look towards New York or other traditional centers for validation. Pritikin writes, “Artists took this rhetoric, originally intended to address disenfranchisement from political decision-making processes, and applied it to the microcosm of an art world that had effectively placed artists in a passive and victimized role, identifying that condition as a political one. As an alternative to such a condition, artists proposed to create their own ground for displaying their works both for their peers and any interested audience.”4 As Pritikin goes on to say, this self-determination impulse took the form of artists acting as curators, cutting out professional gatekeepers and middlemen, establishing parallel economies, including championing paying artists for their work, and acting as decision-makers within the administration of these organizations. 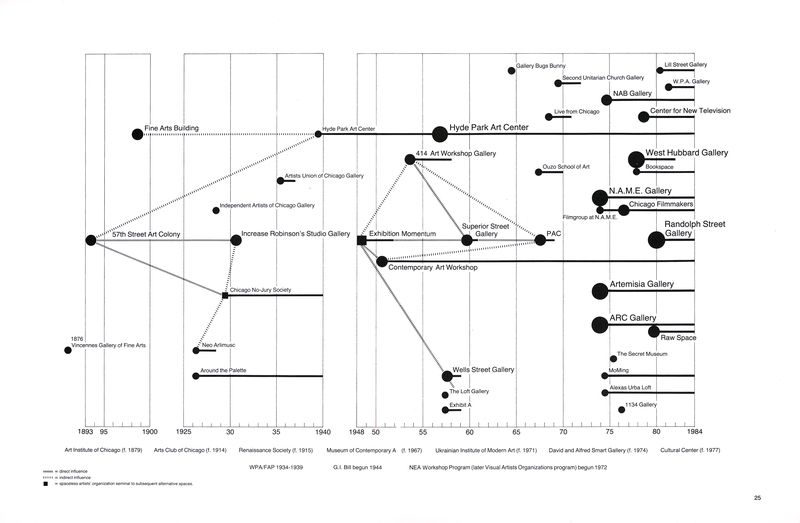 Jerzy Kucinski and Lynne Warren, “History of Alternative Spaces” diagram, 1984, from Lynne Warren, “Chicago’s Alternatives,” in Alternative Spaces: A History in Chicago, exh. cat. (Chicago: Museum of Contemporary Art, 1984) (diagram © Lynne Warren. 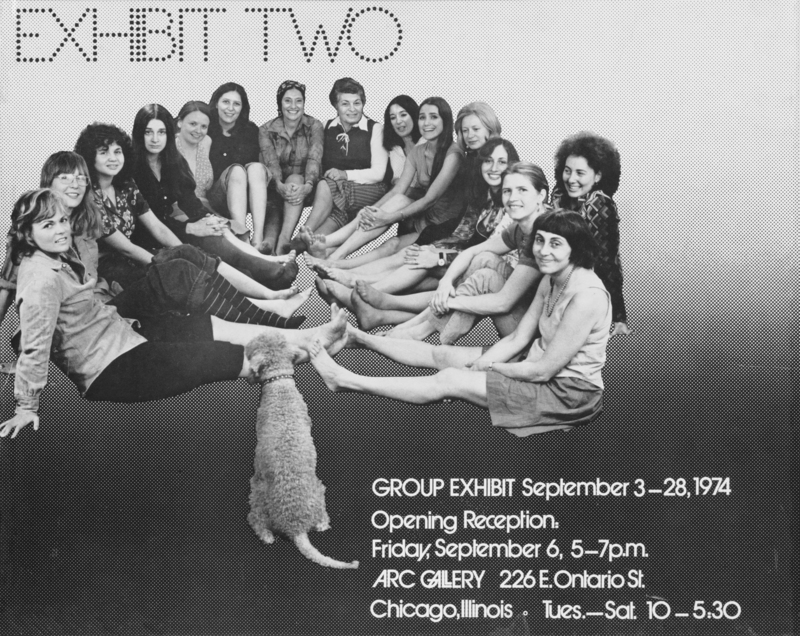 In Chicago in the early 1970s, we had our own third and best-known generation of alternative spaces (each city can claim its own artist-run history, probably with a fair share of boosterism thrown in), such as ARC, Artemisia (both were feminist galleries formed from West-East Bag, a nationwide network of women artists), and N.A.M.E., with the much-heralded Randolph Street Gallery opening in 1979.7 This is not to mention still-running artist-driven efforts such as the Hyde Park Art Center, founded in 1948, and the South Side Community Art Center, the only surviving Federal Arts Center from the WPA era and the oldest African American art center in the country, famously dedicated by Eleanor Roosevelt on opening day in 1940. As Pomeroy points out, new art spaces were nothing new themselves, citing the Salon des Refusés in 1863 and the Armory Show in 1913, both of which were curated by artists in alternative spaces, as the most pivotal exhibitions of the last one hundred fifty years. Yet whatever alternative legacy the fledgling 1970s organizations may have claimed, quickly they also had to grapple with their own institutionality. Fortified by a newly created funding category, Short Term Activities, the National Endowment for the Arts made grants to several artist-run organizations in 1972. In 1973 the NEA initiated a Workshops subheading of its Public Art Program to facilitate funding “alternative spaces,” and in 1977 the NEA created the Workshops/Artists Spaces program, “designed to encourage artists to devise modes of working together and to test new ideas.”13 In 1973 further capacity was built for these spaces under the umbrella of a separate federal program, the Comprehensive Education and Training Act (CETA), a work training program that started under the Nixon Administration, “providing federal public employment to chronically unemployed groups including artists.” CETA provided artists with stipends and also created opportunities for artists to hold paid positions in the new organizations, with salaries starting at $10,000 per year. Many of these conditions, especially that membership organizations needed to be nonprofits, were hotly debated at the time. Yet a committee, drawing from the New Arts Space national conferences, including Joe Celli of Real Art Ways, Al Nodal of the Washington Project for the Arts, Lyn Blumenthal of the Video Data Bank, Robert Gaylor of Center for Contemporary Arts Santa Fe, and Renny Pritikin of New Langton Arts, among others, met to draw up a constitution presented at a subsequent national conference in Washington, DC, which included the provision and also divided the country into seven regions, one of which was, notably, New York City by itself. As Pritikin put it, “My most lasting memory was a blisteringly hot DC summer day with no air, and the whole field in the room, and I asked for each district to stand up in turn when I called their name, and people were in tears. It was so moving that our little underfunded movement had emerged united and powerful and national and broadly representative. What a triumphal moment in my career and life. Each district sent someone to the national board, which met on a quarterly basis with NEA money to support the travel. And that was it, soon setting up an office and hiring a director.”19 NAAO services included a directory of member organizations and other publications on the field, an annual conference, access to arts advocacy information, participation in a multisite collaborations program, and other organizational support. It supported the National Campaign for Freedom of Expression, which was conceived by a group of artists and arts activists in 1989 following the series of controversies about the right to free artistic expression and public support for the arts, later known as the Culture Wars. NAAO fell victim to the Culture Wars after throwing its resources into supporting the NEA Four artists (Karen Finley, Tim Miller, John Fleck, and Holly Hughes), who won their case, National Endowment for the Arts vs. Finley, at the district and appeals court levels, but lost at the Supreme Court in 1998, which led the NEA to stop funding individual artists. NAAO initially folded as an organization in 2001, after which, a group of invested board members attempted to resuscitate it, legally moving its offices to Minneapolis in 2005 and after serving as the fiscal sponsor for the Critical Art Ensemble’s legal defense fund for artist Steve Kurtz, ultimately ceased all operations in 2009. Its history is largely unwritten and unknown to a younger generation of arts administrators and arts activists, many of whom could scarcely imagine that at one point there was a national body of arts organizations championing equitable artist fees and artist power within the decision-making of organizations. These organizations, which numbered seventy-four by the time the initiative concluded in 2011, received capacity-building grants of about $100,000 each over multiple years, along with consulting services to help them maximize the grants’ benefits; each sent its director or board members to convene on a national level every three years. Threewalls in Chicago, where I worked until this year, received funding through the Initiative in 2008 and was able to create cash reserves and take steps toward long-term financial planning. The support was crucial for a financially struggling organization, not only providing stability but also creating a sense of national community and peer support for the work of Threewalls and creating collegial relationships with other founding members of Common Field. In 1999, the same year that the initiative was founded, the Warhol Foundation provided a seed gift of $1.2 million to the Creative Capital Foundation, a new model for artist-focused philanthropy, which revamped the NEA’s discarded individual artist fellowships, seen as no longer politically tenable. Creative Capital worked on a venture-capital model in which artist projects were seen as long-term partnerships with the possibility of monetary return. As Paul Bonin-Rodriguez writes in Performing Policy: How Contemporary Politics and Cultural Programs Redefined U.S. Artists for the Twenty-First Century, “The new artist paradigm being proposed is tempered by a radical pragmatism. Reflective of the nation’s capitalist economy, the market becomes both the institutional medium and its validating destination. The burden of public purpose, which is now and newly being defined as market readiness in 1999, falls squarely on artists who are not standing alone.”23 The notion that artists would literally have to pay the foundation back was subsequently discarded; Creative Capital stated in 2005 that “paying back was now understood as giving back,” meaning continued participation in the foundation’s efforts through fundraising and artist programs.24 As it was one of the most visible funders of individual artists in the United States, Creative Capital’s use of venture-capital principles in its granting model represented a sea change, as professional and project development services were emphasized as much as actual grant monies, reflective of a funding landscape in which professional artists are expected not only to produce their creative project but also to build an infrastructure around their work to maximize impact and leverage future support. Continuing in this new paradigm of “radical pragmatism,” in 2009 the NEA established its Creative Placemaking program, in which “partners from public, private, nonprofit, and community sectors strategically shape the physical and social character of a neighborhood, a town, a city, or a region around arts and cultural activities.”25 Conceived by Rocco Landesman, then the NEA chair, whose background was in producing commercial theater, and senior deputy chair Joan Shigekawa, former associate director for foundation initiatives at the Rockefeller Foundation, where she had commissioned the Arts and Community Indicator Project (focusing on the role that artists play in communities), Creative Placemaking marks a transformative moment, according to Bonin-Rodriguez, for NEA funding. Melding urban policy trends to revitalize “creative cities” and encouraging partnerships among business associations, governmental agencies, and foundations, the NEA formed ArtPlace in 2009 and OurTown Grants in 2011, funded by major foundations such as Bloomberg Philanthropies, the Knight Foundation, the Kresge Foundation, the Rockefeller Foundation, and the William Penn Foundation; by federal partnerships with the US departments of Housing and Urban Development, Health and Human Services, Transportation, and Agriculture, along with the White House’s Domestic Policy Council; and by the financial institutions Chase Bank, Bank of America, Morgan Stanley, Citibank, MetLife, and Deutsche Bank.26 Creative Placemaking grants represent considerable grant amounts that must be spent in a relatively short period, with artists and organizations eligible for grants of $50,000 to $500,000 to be used over eighteen months, and Community Development Investments of up to $3 million for “place-based NGOs” for up to three years. As artists and organizations are rewarded for partnering with local business associations to consider economic revitalization and neighborhood “vibrancy,” somewhere a little fairy stops flapping its wings and drops dead. Of course, the alternative isn’t to swing the pendulum the other way and champion artists for abdicating social responsibility; rather, it means recognizing a historical continuum of arts funding in which the previous arguments for art as a public good in and of itself and artists as special beings with privileged access to social truths is no longer operational. And this fact necessitates that, as a field, we make new arguments as to why and how to champion that important and vital kind of art production not supported by the market or large institutions. Grant Kester assessed this problem in his 1993 essay “Rhetorical Questions: The Alternative Arts Sector and the Imaginary Public,” remarking that participants in the alternative arts sector pre-Culture Wars were too caught up with the romantic rhetoric of their own autonomy and the ethos of experimentation, born in the spirit of social movements and floating in the bubble of government largesse, and thus caught off guard when put under a public magnifying glass and asked to justify themselves in a conservative climate antithetical to their values. Kester writes, “Within the rhetoric of the artist space movement, artists seemed to believe that by rejecting market values they would effortlessly shed their own cultural privilege and operate in a utopian, state-funded, minipublic sphere, founded on ‘sweat equity’ and collectivity. But the withdrawal from the elitist market into a nonprofit enclave doesn’t necessarily bring the artist any closer to various segments of the non-art public—nor does it allow artists to transcend their own class and cultural privilege.”30 While Kester rightly points out that righteous privilege and exclusionary access must always be challenged and that arts administrators need to take the actual concerns of the public seriously, we can also celebrate the freaks, weirdos, and visionaries who came before and didn’t exactly know which audiences or demographics their work was capable of reaching—artists who through their creative impulses sometimes produced searing social critique. Today you could make the argument that we need more of that utopian collective vision that encompasses a politics we can work toward. Why aren’t we having more critical conversations about entrepreneurial value systems and market realities and the pressures they place on under-resourced small to mid-size arts organizations? Or, from within the field itself, the very real and important charge for nonprofit arts organizations to structurally change their norms and practices, which have often resulted, consciously or not, in exclusionary spaces and unequal access? The intentions of the proponents of Creative Placemaking—to address socioeconomic inequities through institutional partnerships via creativity—result in sizeable support of many worthy projects, but they also create a demand to keep space for the small, the countercultural the experimental, even for driving against capitalist logics, which could potentially infiltrate upward and outwards. 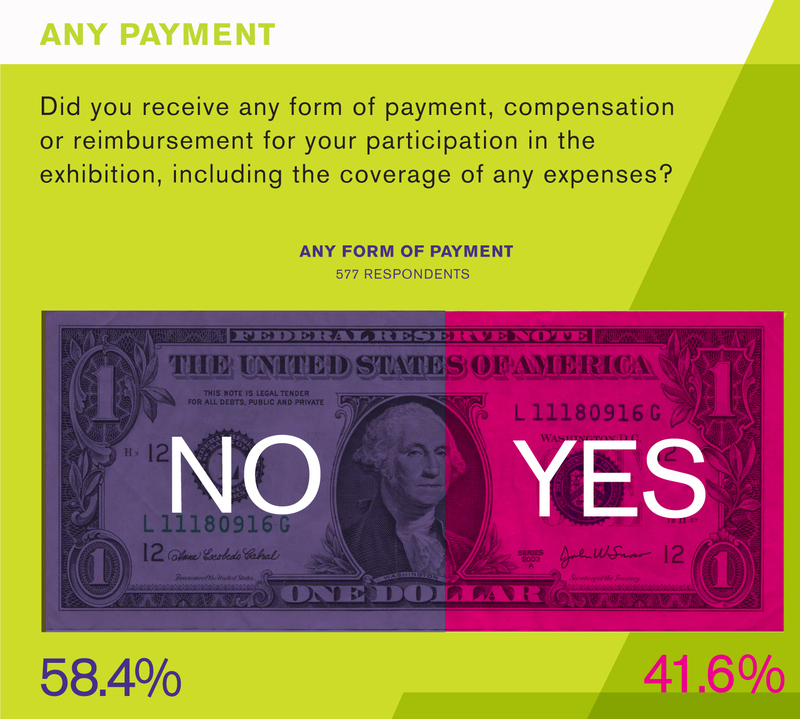 There is the perennial issue that artists and arts organizations are forced to gear the work to what’s on offer from corporate, governmental, and foundation priorities but we can also be agents in shifting the terms for participation. If our struggles are nothing new, at least we can say we’re trying. Some recent efforts to articulate our own values include initiatives like Common Practice, London, founded in 2009 by Afterall, Chisenhale Gallery, Electra, Gasworks, LUX, Matt’s Gallery, Mute Publishing, The Showroom and Studio Voltaire. It is an advocacy group working for the recognition and fostering of the small-scale contemporary visual arts sector in London and has inspired chapters in New York City (2012) and Los Angeles (2013). At Threewalls, we founded the Hand-in-Glove conference in 2011 as a way to start a national conversation on creative activity happening outside traditional institutions, building on Phonebook, Threewalls’ national directory of artist-run spaces and organizations that we’ve compiled every few years since 2006. Hand-in-Glove became an itinerant model hosted by different organizations and partners (including Press Street in New Orleans in 2013 and Works Progress and the Soap Factory in Minneapolis in 2015), promoting critical dialogue and innovative organizing models and under-the-radar opportunities that could be useful to artists and organizers and this year including the launch of Common Field. Other efforts include artist initiatives such as the aforementioned W.A.G.E. and BFAMFAPHD; artists making community infrastructure such as Theaster Gates in Chicago and Rick Lowe and his staff at Project Row Houses in Houston; the collective decision in May 2015 of the entire University of Southern California first-year MFA class to protest its dean’s curricular changes by “dropping out of school and dropping back into our expanded community at large”;31 and recent conferences such as “Valuing Labor in the Arts” at the Arts Research Center of the University of California, Berkeley, in 2014, and “The Artist as Debtor” at Cooper Union in New York in 2015. Common Field will be adding its voice by promoting national conversations and connections, and building resources for practitioners at work in the field. Issues of student debt, racial justice, and equity, the systemic and institutionalized police violence against people of color and poor communities, and the dismantling of public universities are key struggles of our time. It is the responsibility of art and artists to respond to them as much as the general public. Whether artist-run spaces and nonprofit arts organizations can be worthy allies, and equitable and responsive partners, to artists, grass-roots coalitions, and communities on the ground level is our challenge today. Perhaps we can start as publicly wary, debating the terms in light of contemporary contexts, celebrating our radical legacies while not romanticizing the alternative space movement, or past governmental support like CETA and previous iterations of the NEA, and recognizing that we will have to figure out collective ways to articulate and prove our worth to communities inside and outside the art world. In writing about the AACM, Romi Crawford uses the term “serious sociality,” in which a committed society of dedicated readers and viewers “evolved among persons receptive to the free (and often unresolved) forms of artwork that aligned with a particular political sensibility and social agenda.”32 This serious form of collaboration, geared to social change and experimentation, can guide a methodology going forward but requires commitment to being open-ended and accepting that some failures will occur. Should artists and organizations learn to play by the rules, getting inside the system and moving toward change? Or should we count on this field to present a reliable opposition, to always reject the terms that are offered? Developing a shared political sensibility and social agenda is a deep challenge and needs much hammering out. These questions will have to be worked out in public, through practice. This article was originally published in College Art Association’s Art Journal, Fall 2015 issue and received the 2015 Art journal Award. The epigraph is an excerpt from Lawrence Ferlinghetti, I Am Waiting, in A Coney Island of the Mind (New York: New Directions, 1958), copyright ©1958 by Lawrence Ferlinghetti, reprinted by permission of New Directions Publishing Corp. TERRIFIC article. INCREDIBLE research. Rightly belongs in every syllabus of every course of art theory and contemporary American art history in every art school, college and university. Well-done!